Some of the bags dumped at Burghead Harbour in Moray. A caravan and several black bags have been left at the town’s harbour, prompting a strong reaction from residents. The bags are being stored by Patrick Thirkell, who spent over a decade in a dispute with Moray Council over a mess at the Old Mills in Elgin. He had to arrange for diggers to remove rubbish from that site for the third time in June this year. Now he has started storing some of the materials he was ordered to remove in bags near Burghead Harbour. 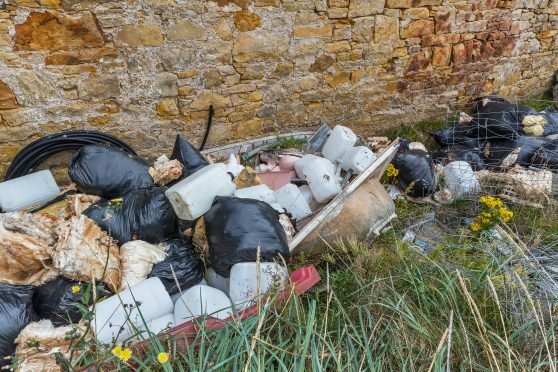 Councillor John Cowe said that leaving the materials so close to the harbour was “unacceptable”, and he called for Mr Thirkell to be fined for fly-tipping. He said: “It is the tourist season, to see this kind of stuff thrown over the wall – what must tourists be thinking about it? And after pictures of the mess emerged, angry residents took to social media to express their anger at the mess. One user said the mess was “vile” and added that the caravan could put children’s safety at risk. Mr Thirkell said that he plans to keep the materials – which he had been ordered to remove from Old Mills – at the site until he can use it to build a cottage at the Elgin site. He said: “I have received many threats of violence and arson, but, as the council says, it’s a registered storage area.